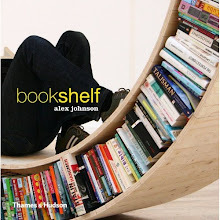 Featuring works that transform books through a variety of mediums, Book/Shelf stresses an expanded notion of the illustrated book. The exhibition begins with a documentation of Marcel Duchamp's Unhappy Readymade (1919)—a work created when the artist, while traveling, asked his sister back home to hang a geometry book on his balcony in order to let the wind flip and tear the pages. 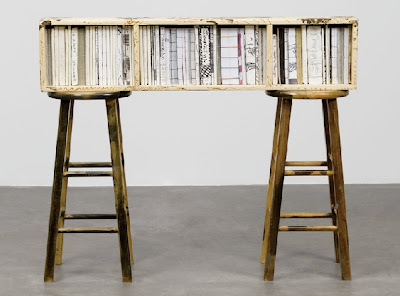 It continues with works in which artists appropriate books by others, such as a sculpture by Martin Kippenberger made partly of books, and a copy of Duchamp's catalogue raisonné rebound by David Hammons under the title Holy Bible. Artists who tackle the idea of books in film (William Wegman), sound works (On Kawara), prints (Edward Ruscha), and drawings (Steve Wolfe) are represented as well. Finally, the exhibition surveys a number of artists who have created installations that display books in public contexts, including Brian Belott, Allen Ruppersberg, Josh Smith (pictured above), and Lawrence Weiner.